Wow, wow, wow. Time has been ticking! I’ve been wanting to hold a (belated) blog birthday celebration give away for the last couple of months. 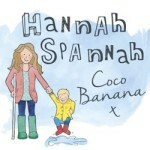 Meanwhile, my brain has been beavering away and writing new posts and I decided to start a facebook page for my blog. Blow me down, but my facebook page has only gone and gained 300 ‘likes’ in less than 8 weeks! I started the page on Valentine’s day and posted for the first time on February 28th. Here I am on April 12th, having reached a goal I hadn’t even dared to set! It’s only right to say thank you for your support by holding a competition! I am excited to tell you (if you’ve not already guessed!) 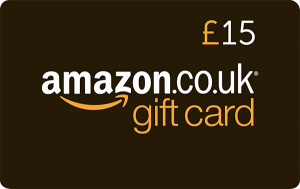 that I have a £15 amazon.co.uk gift card to give to one of you lucky readers! I’d love to know what you would buy with it if you won. Amazon is my absolute go-to shop for EVERYTHING! I’ve batch bought food, bought some clothes for my son, treats for my dog and of course, toys. I buy presents, tools, stationary, things for the garden, you name it. I don’t have a major shopping problem, but due to having Fibromyalgia and Sero Negative Arthritis (and a few other things!) shopping is incredibly hard and painful. I can just about manage the supermarket shop when I have to although I do quite often have it delivered (which is embarrassing as Tesco is less than a mile away! I do wonder what the delivery driver must think!) but I’m almost back at the point of needing a wheelchair to visit shops that don’t have trolleys t lean on or ‘walk’ from shop to shop in town. Crutches are ridiculously hard to shop with as I can’t touch anything and keep knocking things over! Thank you to everyone who has liked and shared any of my posts. Thank you for your support. That’s a great wish list Anne. Fab choices! I had a harness for my kitten (there are some pics on the post about her!) ans she was really good with it although she’s free range now! I was thinking about pimping my NHS crutches soon! Always a good idea. It needs to be done sometimes. Thank you for the chance to win this. I love your Blog posts that come through. It give me some me time to just sit and read. Thank You. Ooooh, Wendy, let me know how this change in diet works for you. I’ve read so many articles about reducing different things in our diet. Almonds are delicious. Do you eat the Meridian Almond Butter? I adore it on rice cakes- so does my little boy! Do you find the almonds help? My husband has fibro but he’s not mad keen on nuts apart from the occasional salted ones to nibble. But I could sneak ground almonds into my cooking, I’m sure he’d love a korma with almonds in the sauce. Thank you so much for the chance to win an Amazon voucher. I love shopping on there – must get at least one thing each week. I would treat myself to a pretty pair of slippers for the summer. My fab woolly ones are getting a bit too cosy now! Oh good luck with your pregnancy! How exciting! Oh, it brings back memories. Try to enjoy it and definitely enjoy the shopping! I would buy a selfie stick! Brilliant! I thought I was the only person without one. Good luck! What a lovely giveaway! I’ve been meaning to buy some more books. Fingers crossed! A few people have said books. I used to read but don’t find the time now. Actually, I lie, if I stopped ‘reading’ Facebook, I’d probably find the time! Good luck! Happy blogging birthday! If I won, I’d buy some kindle books off my wish list, thanks for the lovely giveaway. Thank you Jayne and it’s a pleasure! Fingers crossed! I got my Ergo carrier off Amazon (fulfilled by them so that I knew it wasn’t a fake) and loved it. Good luck to you! A vibrating watch for my daughter to remind her to go to the loo! oooh, is that like an actifry? I can’t decide whether to go for one or not. They look great though. Good luck! Well done on getting to 300 likes! I would spend it on kindle books – I’m addicted to reading! Thank you Zoe- inn part due to your massive blog makeover! When do you read? I don’t ever seem to find the time! Wish I did though. Good luck! BLACKOUT CURTAINS!!! Toys can wait! Good luck! Failing that, I would probably buy the 5 year diary that I have had my eye on for a very long time, it seems like such a nice idea to keep a diary for 5 years and get to look back over it and see how things have changed! Thank you Jade! The 5 year diary looks so good. I wish I’d started one for my son when he was born. I think I might start one anyway! How exciting to buy for a new baby niece! Good luck! Is that a game or a toy? y boy is only 3 so we have all this to come! Good luck! I’m stuck in a wheelchair after some mega surgery so can’t go shopping – with some family birthdays coming up this would go someway to organising a little prezzie or 2! Anyone particular? I like good old fashioned cook books with all the essentials. Good luck! I would buy some books on Africa, my current favourite reading. Lovely. Have you read ‘Out of Africa’? I was lucky enough to visit her house in Kenya with my mum but it was before I had read the book or seen the film. I wish I could go back again. Good luck! It’s a pleasure Sara! How many books are in your basket and what genre do you prefer? Good luck! I’d put it towards some new trainers. Nice. I love the Tiffany blue Nike’s. Good luck! WOuld you buy CD or download? I’ve still got my cd’s but nothing to pay them on except my car! I’d put it towards a new sheepskin rug for my bedroom! oh, lovely. I love the feel of sheepskin rugs on bare feet. Perfect for when you’ve just climbed out of bed. Good luck! Are there any you have your eye on? I never know which books to read and spend hours in book shops choosing! Good thinking. Anything in particular? Good luck! I would treat my toddler and baby to something nice. What a lovely mummy. Try not to forget yourself. Good luck! Download or cd? Good luck! Are you planning a trip to anywhere nice? I have wanderlust. I miss traveling so much. Good luck! Good luck! What genre do you prefer? Wife constantly finds thing to buy on Amazon, so I need all the vouchers I can get!